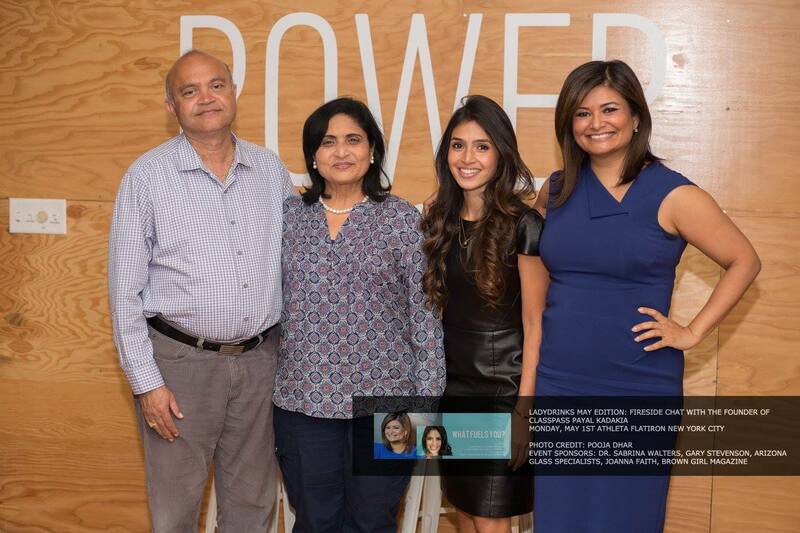 ClassPass founder Payal Kadakia (center right) with her parents (left) and LadyDrinks' Joya Dass (right). All photos are courtesy of Pooja Dhar of PR Photography. It is incredibly important to hear perspectives from women with whom you can relate; women who understand your everyday struggle, but strive, like you, through it. 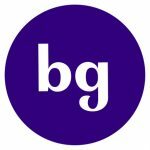 I cheered for Payal Kadakia when I learned how successful ClassPass became. 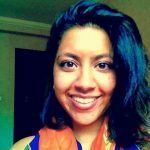 She not only represented women leading at the forefront of entrepreneurship, but she also represented Indian women. She represented me, and she did it with grace, passion, and determination. 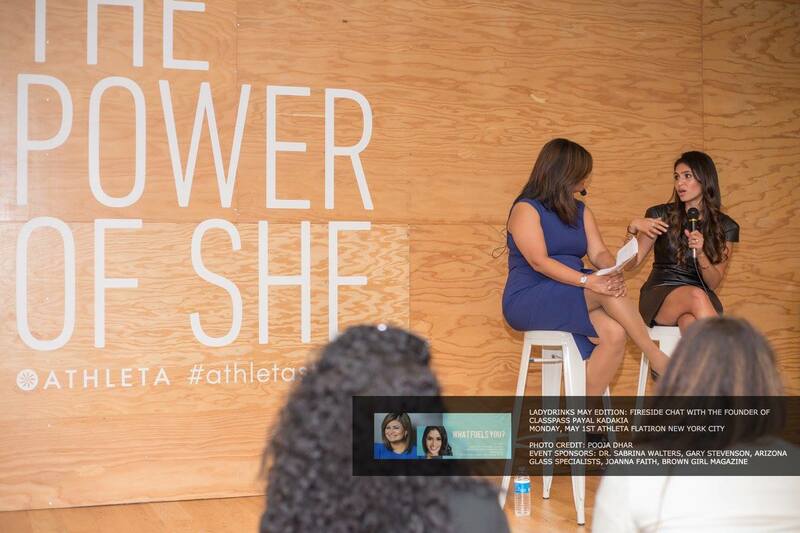 As I walked into the Athleta Studio on 5th Avenue in New York City, I faced the studio’s wall which read Athleta’s mission of influencing “The Power of She,” and I thought Joya Dass chose the most fitting place to host her LadyDrinks’ May Edition: Fireside Chat with ClassPass founder, Payal Kadakia. Women of all ages, and a couple of men, one of them being Kadakia’s father, leaned in to hear how the 34-year old built her company simply from her love of dance. “I felt like I was leading two identities,” Kadakia reflected. Before her complete transition into pursuing her true self, she worked for Bain & Company, where sitting behind a desk no longer represented the best part of who she truly was a person. As an MIT graduate, Kadakia was raised and truly believes education is important, but pursuing one’s passion- feeling complete in your own skin- is just as important. “Dance was my place,” she proclaimed, and it led her to create Sa Dance Company, allowing her to dance full-time. Her creation of ClassPass, however, didn’t happen overnight and her vulnerability in sharing this with her admirers is what makes her stand out as a rising leader in the tech industry. Kadakia graciously offered how she did get it right by creating a company that truly represented her desire to provide access to a variety of ways people could stay active in their lives. 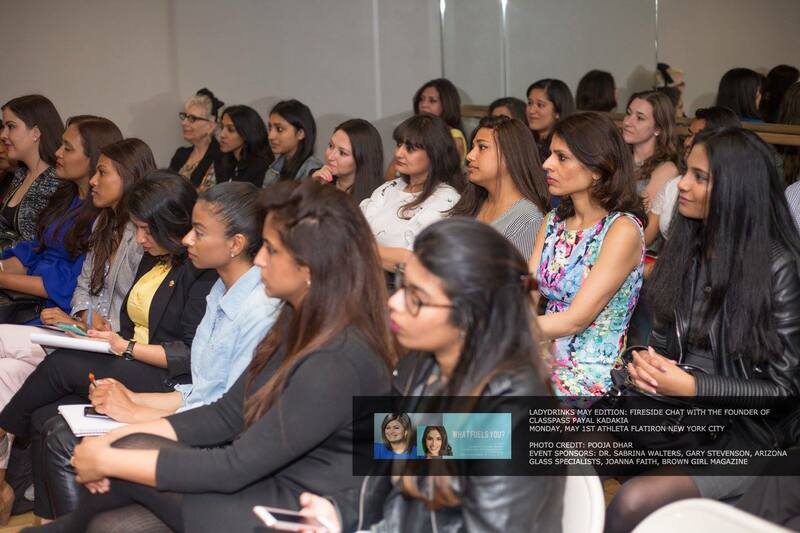 As she spoke, women in the room began to vigorously write, record, and snap her truth. Kadakia gratefully acknowledged her parents who sat proudly in the back of the studio. 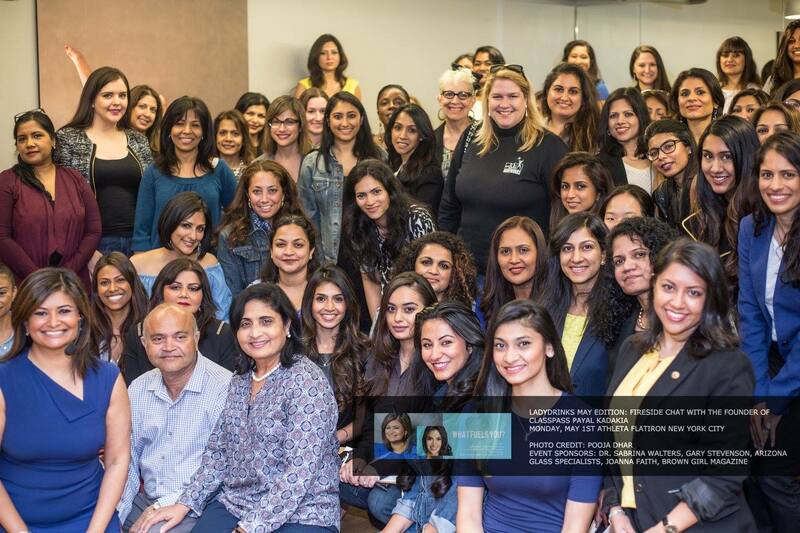 To me, what Kadakia really shared was an opportunity for South Asian women in the room to imagine and believe in what they could all become. For a long time, I believed heavily in the quote, “you can’t be what you can’t see,” because I rarely saw anyone like me when I looked at covers of magazines, in our politics, or leading their own businesses. This concept does not have to be true for Indian women. Kadakia confidently proclaimed that being Indian and being a woman had never felt like a challenge to her. 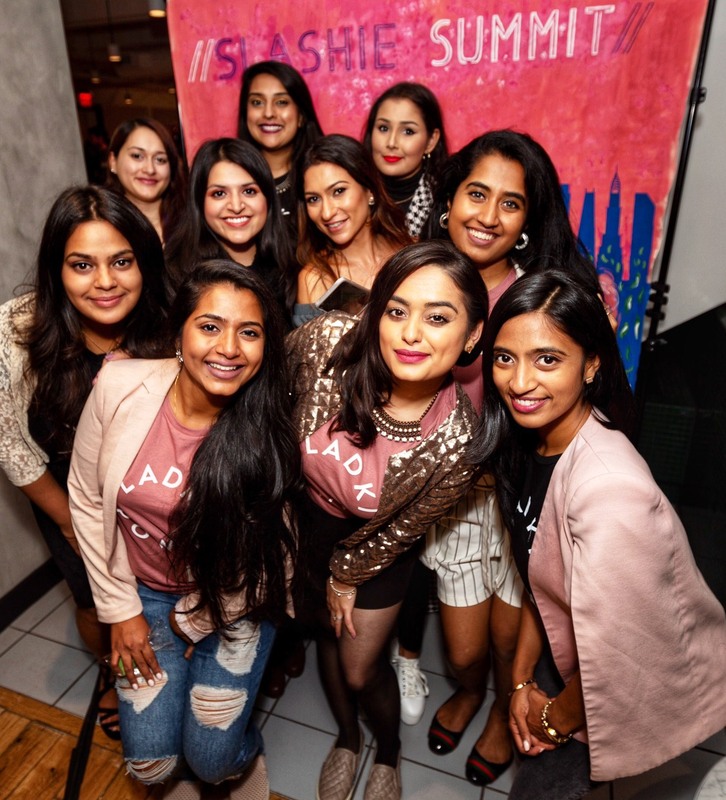 Because of Kadakia’s confidence, leadership, and fearlessness, ClassPass has expanded to at least 39 cities in the United States and has also grown internationally. Kadakia hopes ClassPass will become the destination for what you want to do.